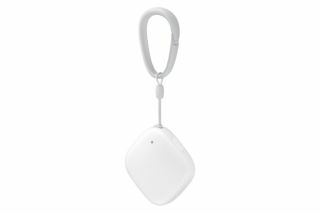 Samsung has announced the upcoming release of its Connect Tag, which appears to be its own take on the Tile, a device you can slip into a bag or onto your keychain so you can easily find these items if you lose them. Parents can also use it to help keep track of their children, hopefully in order to ensure their safety and their own peace of mind. The Tile, though, always required a very specific set of circumstances to work properly. Samsung’s Connect Tag appears to be a substantial improvement. The Korean electronics company calls it the first mobile device for consumers to use narrowband Internet-of-Things technology (NB-IoT), which consumes significantly less power than cellular devices. In the case of the Connect Tag, that gives us a barely noticeable square of white plastic that’s only 4.21cm wide and 1.19cm thick. That’s about the size of a jumbo guitar pick, which means it’s small enough that you can slip it into nooks and crannies of your luggage or purse where thieves won’t easily find it. Since it’s both water- and dust-proof, you can even slip it onto your dog’s collar. But the chief advantage over the Tile here is that the Samsung Connect Tag doesn’t need someone else running the associated app on their phone to be standing nearby so you can use it. Instead, the Connect Tag can pinpoint the location of your item (or loved one) at any moment, all while offering handy services such as notifications when the tag moves past a set perimeter (all the better, seemingly, to find out if little Jimmy is skipping school). It also works with Samsung’s SmartThings “Internet of Things” hub by allowing you to, say, automatically flip on the lights when you walk into a room. Awesome, right? Unfortunately, all that Samsung compatibility means it’s limited to Android devices for now. Sorry, iPhone users. The battery also only holds a charge for around a week, compared to the year or more you can get out of a Tile. Hopefully a week is enough time for you to realize you’ve lost whatever it is you’re looking for. Unfortunately, the short battery life (for what it is) also means it’s yet another device we need to add to the ever-growing list of items we need to keep regularly charged. And as for price? Samsung is staying mum for now.